atmospheric visibility; refraction effects; contrast phenomena; noctilucent clouds; optics of lightning; auroras; colors created by absorption and scattering in water and air; color and light in water and on water surfaces; iridescence and colors in biology and geology; atmospheric optics in history and archaeology; and computational techniques for calculating and rendering optical effects in the atmosphere and landscape. For submission: please submit a 200-word abstract that includes title and author list (you also may include a color or gray-scale image that illustrates your topic). File formats accepted are plain text, pdf, doc, and docx. All accepted abstracts will be given as oral presentations. Abstracts may be submitted via email to optics.submissions@gmail.com. The deadline for abstract submission is Monday, April 15, 2013. The committee will review all abstracts and notify authors of acceptance by May. Click here for registration … including options for submitting abstracts (if you , requesting travel assistance and/or reduced student registration rate). 4) “Light & Color in the Open Air”, July 11-13, 1990, Washington, D.C. Following each of the previous meetings, the Optical Society of America (OSA) has generously published a Feature Issue of one of its peer-reviewed journals. These Feature Issues draw heavily (but not exclusively) on contributions made at these meetings. In line with this tradition, a Feature Issue of Applied Optics will be published during 2014. A dedicated web-site (http://lightandcolorinnature.org/2013-conference/) will be updated regularly to provide the latest information about the conference (e.g. accommodation, venue, schedule, etc.). 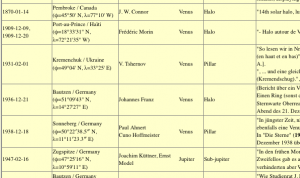 At this 2010 meeting of The Color and Light in Nature Conference Rainer Schmidt introduced a comprehensive bibliography of halo observations, particularly those reported before the internet age. As of earlier this month there were 9719 entries in this invaluable resource. You can find out more about that project by reading the English description he presented at the conference. Recently Rainer has announced a new section/service of the website which extracts and goes into greater depth, with quotations and comments, those entries of the bibliography pertaining to halos generated by celestial light sources. 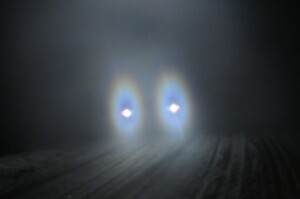 Due to the difficulty in observing these phenomena, there are few documented sightings listed so far. Your submissions for entries missed in the bibliography are desired, see the contact information listed on the website. Optics–a field of physics focusing on the study of light–is also central to many areas of biology, including vision, ecology, botany, animal behavior, neurobiology, and molecular biology. The Optics of Life introduces the fundamentals of optics to biologists and nonphysicists, giving them the tools they need to successfully incorporate optical measurements and principles into their research. Sönke Johnsen starts with the basics, describing the properties of light and the units and geometry of measurement. He then explores how light is created and propagates and how it interacts with matter, covering topics such as absorption, scattering, fluorescence, and polarization. Johnsen also provides a tutorial on how to measure light as well as an informative discussion of quantum mechanics. The Optics of Life features a host of examples drawn from nature and everyday life, and several appendixes that offer further practical guidance for researchers. This concise book uses a minimum of equations and jargon, explaining the basic physics of light in a succinct and lively manner. It is the essential primer for working biologists and for anyone seeking an accessible introduction to optics. The book is now available in both hardcover and paperback and is published by Princeton University Press. The media attention continues for the recently published triple and quadruple rainbows… this time in “The Times” of London. A rainbow is a wonderful sight, and a double rainbow even more so. But a German photographer has taken rainbows to a new dimension — he has captured both triple and quadruple rainbows. On June 11 Michael Theusner was watching a thunderstorm approach his home town of Schiffdorf, near Bremerhaven in northern Germany. “I went to a field road by car to take some photos of the storm clouds. Just after I had arrived, about 6pm, heavy rain started . . . I waited and hoped that the Sun would come out soon and produce some nice rainbows. When it did, I realised that the dark clouds covered the sky to the right of the Sun.” And those dark clouds beside the Sun gave exactly the right backdrop to catch the elusive third and fourth rainbows, later revealed with sophisticated photo processing and which can be seen at http://bit.ly/nXmqQZ. According to the Optical Society in the US, there have been only five scientific reports of triple rainbows in 250 years, and none of the quadruple bow. In fact, some scientists said that both types of rainbows were a myth. It is easy to see why they remained so elusive because primary and secondary rainbows are easy to see as they light up the sky away from the Sun. But tertiary and quadruple rainbows form close to the Sun, where the intense glare of the Sun makes them extremely difficult and dangerous to see. They only start to become apparent against a dark background of thunderclouds with a heavy downpour, or a shower of nearly uniformly sized raindrops. Even then, a filter is needed to cut out the Sun’s glare and photo processing needed afterwards because the bows are very faint. Although very rare, the extra rainbows are created in just the same way as normal rainbows, by sunlight refracting and reflecting inside raindrops before beaming out into an arc . A triple rainbow forms when the light rays are reflected three times inside the raindrops, and a quadruple bow has four internal reflections, although its colours are reversed and the bow is even fainter. There have been several nice news articles about a historic halo diagram described by Eva Seidenfaden in the 1 Oct. 2011 Applied Optics feature issue on light and color in the open air. There has been fabulous attention paid by the news media to the photographs of 3rd-order and 4th-order rainbows published in the 1 Oct. 2011 Applied Optics feature issue on light and color in the open air. Take a look at some of fabulous images from the feature issue of Applied Optics, published on 1 Oct. 2011, primarily with papers from the 2010 light and color meeting. One of the primary products of each light and color meeting is a collection of papers published in a feature issue of a peer-reviewed optics journal. Here is a full list of the issues that have been published. The URLs will take you to the online record of each journal (full access to pdf copies of the papers is available to journal subscribers). Philip Laven has provided a great web list that includes links to many of the feature issue papers on the authors’ web pages.